The amazing array of nice things to say about Albufeira is definitely endless. 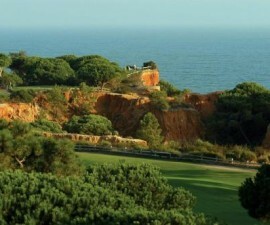 During the day, this sunny coastal city in central Algarve, Portugal, is the perfect place to sunbathe in one of the many wonderful beaches and explore the surroundings around the old town; at night, the city takes up a whole new personality and the vivid colours onto a sophisticated background are brought to life. With so many offers across the beachfront restaurants, the best way to start your evening will definitely be in one of the many food hubs inspired by the best international and traditional cuisines. 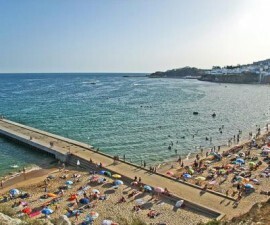 Whether you choose to visit Albufeira with your family or a group of your closest friends, the options are virtually uncountable. As the night becomes denser and darker, holiday makers begin to crowd up the main square in the old town, Largo Eng.º Duarte Pacheco, where usually performance artists gather to entertain the passers-by. Rua Cândido dos Reis and Cais Herculano are also great options to have a good time amidst bars and discos of every kind and for everyone. 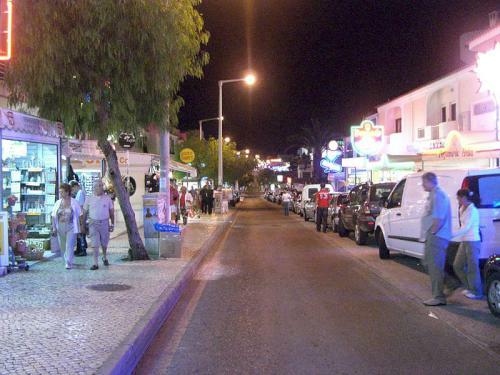 Although you cannot get away from the nightlife in Albufeira no matter where you are, the most coveted place to be is the so-called The Strip, a far-reaching avenue end-to-end with Oura Beach. 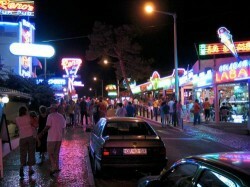 The Strip is known for its multi-coloured lights hanging on each bar and disco across the entire avenue, with massive hordes of tourists visiting one bar after the other. Almost every bar and disco have a similar line-up which exists mainly to satisfy everyone’s needs for an unforgettable night out. DJs coming from all over the world every week playing the latest hits, karaoke, drink contests, live performances, and much more are the ideal ingredients for everyone strolling up and down The Strip looking for some fun and soaking up the amazing atmosphere. Perfect for young groups who are looking for a lively, party holiday, The Strip is always full of hen & stag parties and people hopping from one bar to another in search of the best happy hour! 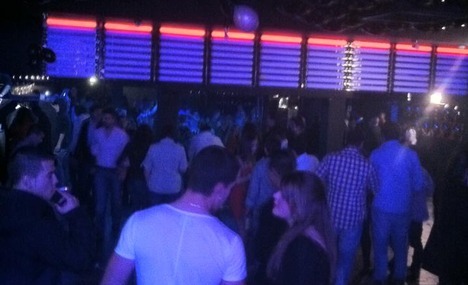 Because of the number of bars & discos in The Strip, there is always some bar or disco trying to make a difference and stand out from the crowd in Albufeira nightlife. Take, for instance, Matt’s Bar, one of the most crowded and popular bar in The Strip. At Matt’s Bar, there is always something going on and usually it is possible to partake in pre-parties — Kiss Club Foam Party, for one — with special prices on tickets, jelly shots, and champagne boat races. There is also a rodeo bull outside on the large terrace, which is a safe guarantee of an awesome time. DJs every week delivering tasteful, fun UK urban music are a must at Matt’s Bar, and although it closes at 4 AM, everything here is a guarantee of a fantastic time. Renos Bar is another favourite amongst tourists, with local DJs every week, dance floor, karaoke, and even live sky sports channel. Renos Bar is close to the Patcha Cocktail Bar, which features a big UK DJ star every week playing the latest UK music hits. Both Renos Bar and Patcha Cocktail Bar are open until 4 AM and account for a great night to meet gorgeous people and dance until you drop. 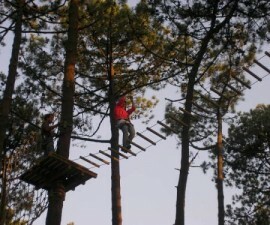 Wild & Co. is definitely one of the main choices amongst Albufeira holiday makers. Its selective environment and lively interior design turns it into a genuine kind of place. Located at the end of The Strip, right up to the beach, Wild & Co. is known for its charisma and theme parties and events. The peculiar mix between an Irish Pub and an American saloon gives the Wild & Co. a unique trait that no bar can possible begin to attain in Albufeira nightlife. 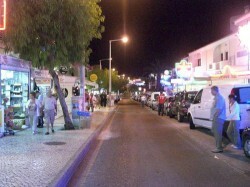 In case you are wondering how in the world you could ever possibly organise an event or a stag & hen party at The Strip, wonder no more: there is a company called Albufeira Bar Crawl that is ready to show you around the bars and restaurants and give you and your friends the best night out you have ever had. For an arranged fee, you will be presented with limbo competitions, free drinks, VIP access to certain bars and discos, champagne races, wheelbarrow races, you name it! There are nine bars partaking in this nightlife experience and the night can span between 8 PM and 4 AM.